One of the very first books to be donated to the University of Cambridge bears a very personal note. 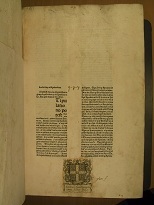 The book is a copy of Bartolus de Saxoferrato, Super secunda parte Digesti novi, printed in Venice by Vindelinus de Spira in 1473, Inc.1.B.3.1b. As testified by the inscription “… My lord chawnceler” in the lower right corner of leaf [a1] recto, it was previously in the possession of Thomas Rotherham, Archbishop of York and Chancellor of England. 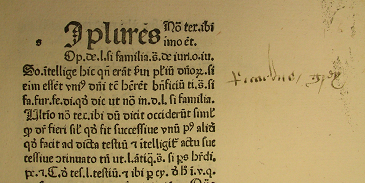 The book has some marginal annotations that may be attributed to Rotherham himself. Particularly intriguing is a note beside a passage relating to unlawful killing on leaf [x5] recto: the note records the name “Ricardus grey” and it seems to refer to the execution of Richard Grey, the half-brother of King Edward V, carried out on the orders of King Richard III at Pontefract Castle on 25 June 1483. The note must therefore be nearly contemporary to the event, as the bishop donated the book to the University around 1484. With the same donation came a companion volume of Bartolus’s commentary, i.e. 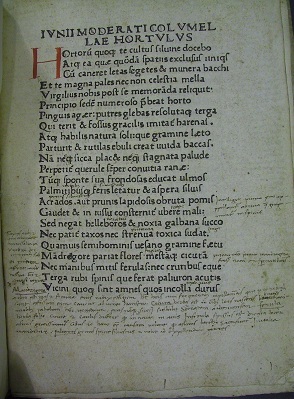 Vindelino’s princeps of the commentary Super Secunda parte Digesti veteris, now Inc.1.B.3.1b. This imperfect copy of the book is the only one to be found in Britain among the eleven exemplars of the edition listed in ISTC (ISTC ib00225900). 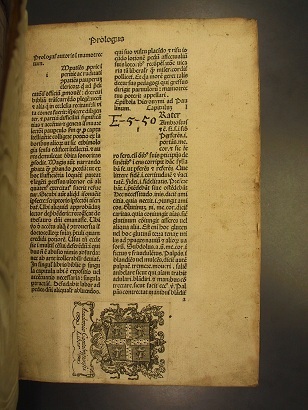 Many other incunable books that are rare or unique, i.e. the only recorded surviving copy of a specific edition, can be found among the library holdings. This is the case for Columella’s De re rustica, Liber X, De cultu hortorum, attributed to the Printer of the Silius Italicus in Rome around 1471, Inc.5.B.2.5. Bought of the London dealer Uriah Maggs in 1894, the book bears extensive marginal and interlinear manuscript notes written by an Italian owner in humanistic cursive hand on the first two leaves, [a1] recto – [a2] recto in the late 15th century. Some of these rare books are beautifully illustrated by woodcuts. 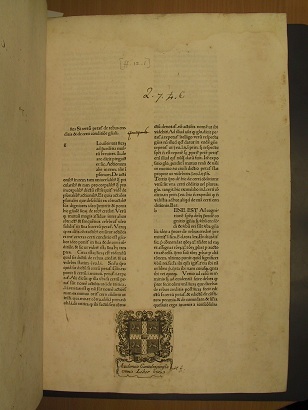 A recent addition to the online catalogue is an incomplete copy of a rare edition of the Mirabilia Romae vel potius Historia et descriptio urbis Romae published in Rome by Stephan Plannck on 7 September 1500, now Inc.7.B.2.26. 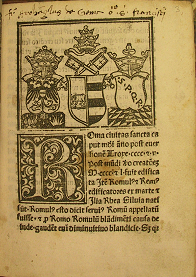 The incipit on leaf [A3] recto is illustrated with one woodcut initial and a half-page vignette with the imperial, papal and Roman arms, tiara and crowns: the papal arms are those of Pope Alexander VI (r. 1492-1503). 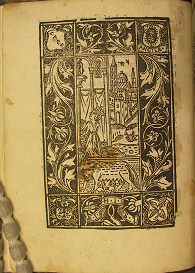 The book bears nine other full-page woodcuts with decorated borders including the fourth device of Johannes Besicken “I.H.I.S.” (see Sander 4550). 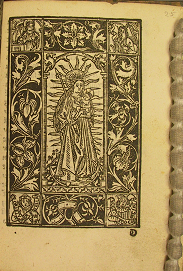 The full-page woodcuts represent: Rea Silvia and the Capitoline wolf with Romolus and Remus on leaf [A2] verso; the Veronica on leaf B8 verso; St John on leaf C2 verso; St Peter on leaf C5 verso; St Paul on leaf C7 verso; Virgin and Child on leaf D1 recto; St Laurence on leaf D2 verso; St Sebastian on leaf D3 verso; and the Crucifixion on leaf D5 verso. 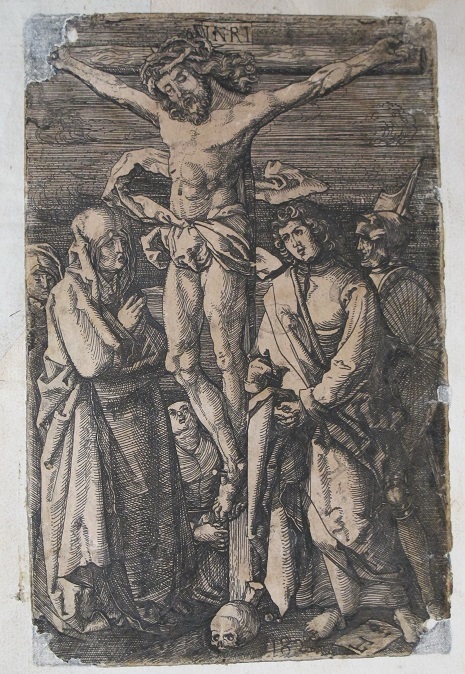 Only one other copy of the edition is known to survive in the Ambrosiana Library of Milano. The book was given to the library by Charles Fairfax Murray, artist and art connoisseur, in September 1918. An early 16th-century inscription on leaf [A3] recto reads “Fr[ater] Archa[n]gelus de Creme [?] o[rdinis] S[ancti] franciscj”. We have been unable to identify Frate Arcangelo da Crema and therefore any further information on the identity of this Franciscan friar would be gratefully received. Equally unidentified are the two 16th-century English owners of a copy of Johannes Marchesinus, Mammotrectus super Bibliam, published in Venice by Nicolaus Jenson on 23 September 1479, now Inc.5.B.3.2. John Peers and John Webbe inscribed their names in 16th-century cursive script on the parchment upper endleaf, one under the other. The book is still bound in brown calf over wooden boards, with blind-tooling, traces of leather straps and metal catches at fore edges, and original parchment endpapers. 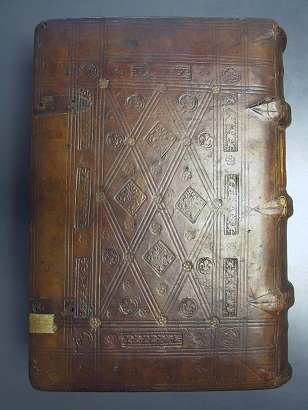 This is one of the many medieval and renaissance bindings that can be found in the library incunable collection. It is datable to the late 15th century and was possibly produced in Cambridge. It came to the library as part of the Richard Holdsworth Bequest, which was adjudged to Cambridge University in 1664, and bears both the old university shelfmark “E-5-50” and armorial bookplate on leaf a1 recto.